Rapid visual prototyping of small Artificial Neural Networks (ANNs) for K-12, college, research, or general academic environments. Place the NeuralNetworkExplorer_Beta.jar file on the Operating System Desktop or in a folder in the file system. Double click on the NeuralNetworkExplorer_Beta.jar file to run the Neural Network Explorer application. When the Neural Network Explorer starts up, it will look for NNEMemory.nne in the working directory and open it up. If NNEMemory.nne is not found, then Neural Network Explorer will start up with a fresh blank workspace and you have to create your own graph. This is a desktop application written entirely in Java 8, runnable with a JVM installed on user's OS. Internal DAG (Directed Acyclic Graph) built with automatic calculation functionality for all outputs. Select the type of Neuron Activation Function for each Neuron. Save the Neural Network to your hard drive. Open any previously saved Neural Network from your hard drive. Architecturally, the Neural Network Explorer application adheres to the Model Viewer Controller (MVC) design pattern. Shown below is a visual mapping of how MVC is segmented with respect to this project. The Model is a componentized Object Oriented data structure used to create a Directed Acyclic Graph, whose nodes comprise a doubly linked list with a many-to-one relationship. The small node icon at the top of this page shows a visual representation of one logical Neuron Unit. The Viewer is a graphical panel in the GUI that allows the user to see a representation of the Artificial Neural Network. The viewer allows the user to drag Neurons around and connect them together, but the actual logical connections are made in the Model. The Controller is responsible for program start up, and directing communication between the Model and the Viewer, as well as all other tasks associated general program overhead. The Controller does have it's own portion of the GUI footprint shown in the middle layer of the sandwiched image below. Developers -> A brief Object Oriented Class architecture explanation and java class definitions can be found on the github link for this project. In this article, we focus our attention on how Object Oriented Programming techniques can represent a biological system such as a Neural Network. 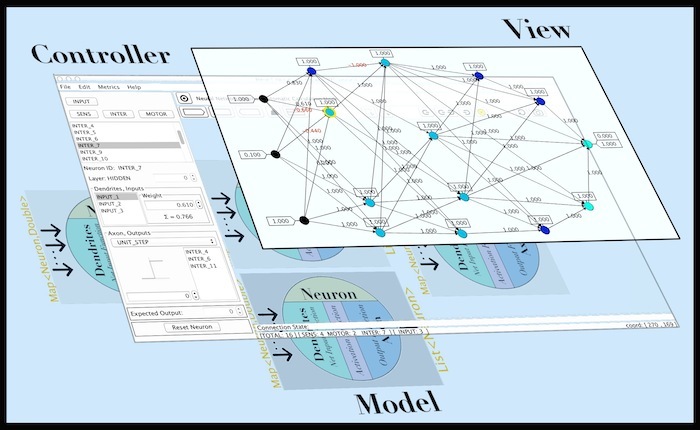 We continue refining our digital model of a neuron, define the Net Input Function, and begin discussing how a neuron processes information. This section is for developers who wish to take a look at or utilize the source code for the Data Structure(s) for the Neural Network Explorer. "GitHub is a development platform inspired by the way you work. From open source to business, you can host and review code, manage projects, and build software alongside millions of other developers."